If only we could find the reason for the rhymes. Villain Construction - Tano Caridda of "La Piovra"
I tried like heck to resist La Piovra, or The Octopus, a long running Italian television series from the late 80s and 90s that has been showing for on my local public television station. The multiyear series is a straight-up soap opera about the Sicilian Mafia. The first year's series made it easy for me, the central character was a cardboard cut-out detective who's incorruptible nature made him dull as dishwater to watch. The show set up a series of predictable obstacles to the central character; from the killing of his trusted assistant to corrupt policemen undermining him to the kidnapping of his daughter. His jaw clenched tighter and the detective moved onward. But a couple of weeks ago I tuned in out of boredom and was fascinated by a character whose presence had somehow escaped me in earlier viewings - Tano Caridda. In the episode I watched Tano explained how he had learned to live among madmen while confined in an insane asylum. Tano (and it is very telling that the series' writers emphasize this simple, memorable name) was a sort of Mafia financier in the early stages of the series and obviously modeled after Roberto Calvi. Now, as in the time La Piovra was originally on air, banking is a link between the Vatican, the Mafia and the Italian political establishment. In the television series, the laconic Tano stands at the center of byzantine plots and betrayals. He is ostensibly a Mafia member but is often in league with police and prosecutors when it suits his purposes. "Tano is for Tano," as the character explains in the clip above. The episode I watched showed Tano sitting in the middle of an ornate palazzo looking at a bank of computer screens mounted on a plain, white wall. 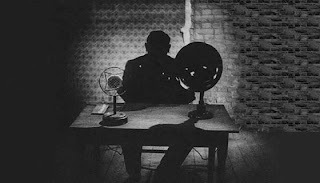 The imagery reminded me of Fritz Lang's Dr. Mabuse - sitting in shadows and directing his elaborate schemes. I admit that the character Dr. MacKenzie Catalpa in Manny Tippitoes is modeled after Mabuse. He is, after all, a criminal mastermind fronting as a psychiatrist. As I've investigated La Piavra and Tano's role within the series, I've hit upon some curious aspects to the character. With each succeeding series Tano played more and more of a center role. The beginning of one year's episodes even flashed back to his youth to tell a back story - Tano is the illegitimate son of a Mafia chieftan. Thusly, he is driven both to climb his way through the criminal organization and avenge his raped mother. That's some motivation. What I've seen and discovered about Tano Caridda will be reflected in the portrayal of Dr. MacKenzie Catalpa in the next Manny Tippitoes book. The character's plots and ambitions will be developed, although I'm not quite certain how I can get Dr. Catalpa an abandoned castle headquarters on the slopes of Mt. Aetna. Well, you know... what can I say. I've been reading some books and doing some research and then out of left field something has come up that has and will inspire a good part of the second Manny Tippitoes book. This guy destroyed some swan eggs. That, in and of itself, is senseless and destructive but also petty and pretty trivial. The Swan Pond is the center of the small town/suburb I grew up in. There were rewards posted and ultimately the culprit turned himself in. It's been a little bit of home town drama for me to keep an eye on and a source of some inspiration. There is all kinds of mythology and folklore centered around swans. 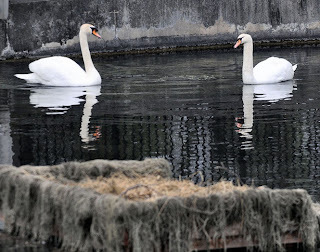 Celtic and Norse mythology abound with stories of swan maidens and Jean Sibelius entitled one of his most famous works Swan of Tuonela. There's some material there. Salon confirms it: a good pair of socks can "lend you an air of sartorial splendor" and "imbue you with a soupcon of worldly expertise..." Also; wool is the way to go. It appears that Italian socks are highly rated by this article's author and main source of information. I submit that they both need to do a little reading, and I can suggest where. The Airtight Garage is now closed. The subtle paradox that tugs at the eye of his audience is that everything portrayed — the landscapes, denizens, technologies and even physics — is totally alien but also completely unified in presentation and rendered with the confident precision of a surveyor who has walked every inch of a property. That's something to aspire to as a writer. Valentine Williams was a prolific author of Country House mysteries in the twenties and thirties. I didn't know this when my father-in-law pulled a box of old books out of his basement. I find old books irresistible and grabbed a few that looked interesting. The Portcullis Room is one of two books Williams wrote in 1934. I was attracted by the embossed "Secret Service Series" designation that cuts diagonally across the cover. The murder mystery in this book is investigated by two men who kinda-sorta solve the case. And the setting, a grim castle on a Scottish Isle, is almost too stereotypical to be believed. So, quite frankly, is the menace from a Swedish crime lord. Williams did not exactly presage Henning Mankell. So why did I read The Portcullis Room to completion? An exercise in form like this book can be very instructive to a writer. The variation on the Country House murder model, a group of people trapped in one building with a murderer in their midst, is not particularly inventive here. As I mentioned above, although the setting has the potential to be threatening the characters are leaden stereotypes of dour Scots, flighty ingenues and clumsy gangsters. Both "investigators" are described by the amount of cigarettes they smoke. Over all, The Portcullis Room is a dud. It's failures, however, tell me about what not to do. And the cover is still cool. I took a trip to New Orleans this past weekend. If a vacation can be said to be productive, then last week's holiday certainly was. Not only in terms of the fun time that Mardi Gras implies, but also with the chance to consult with a very special contributor to the Manny Tippitoes opus and to look around at the varied forms of creativity that contribute to Carnival. The chance to look over the parades and the varying approaches taken by the krewes that create floats and parades was priceless. In New Orleans, krewes take on names like Druid, Proteus, Bacchus, Muses, Comus and Thoth. They refer to themselves as Mystic Orders. Floats, beads and doubloons are rife with imagery from Egyptian, Greek and Celtic mythology. The city was awash in the stuff in a way that belies the presence of the Catholic Church that hangs over New Orleans. Throw in the fact that floats are preceded by masked riders and manned by masked attendants and you'll see how I was fascinated by the whole process. Not just food for thought - a banquet.